Just made this this morning, whole family loved it. A bit time consuming, but sooooo gooood. The pic above is for a red, white, and blue 4th of July version. 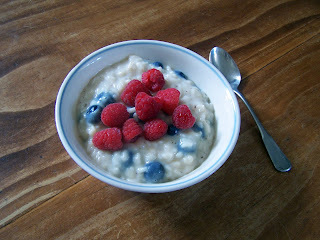 Exact same as below, with fresh raspberries on top. In a saucepan heat the milk, water, vanilla extract, and salt until steaming (but not boiling - you don't want to scorch it). Add the rice and a cup of the liquid to another saucepan, and stir until the liquid is absorbed. Repeat until all the liquid has been used, and the rice is done but al dente (about 30-45 min) stirring constantly. If necessary (if all the liquid is gone but the rice still isn't as done as you like it) add a little more water to the empty liquid pan, heat and use it to get the rice to the doneness you enjoy. Stir in the butter, maple syrup, cinnamon, and blueberries. Serve. I want to eat, so nice looking!